Vocational education will help realise UAE Government’s industry sector goals. Mark Andrews, Head of Pearson Qualifications International (PQI) in the Middle East, believes that quality vocational education programmes will be instrumental in helping to achieve the vision of the newly launched Industrial Council. Dubai: On the 17th April 2016, the Cabinet of the UAE, chaired by His Highness Sheikh Mohammed bin Rashid Al Maktoum, Vice President and Prime Minister of the UAE and Ruler of Dubai, endorsed the launch of the Industrial Coordination Council. The establishment of the Council forms part of the UAE Government’s 2021 vision to build a diversified, knowledge based economy. It is hoped that the new Council will drive the growth of the Emirates’ industrial sector, helping to increase the sector’s contribution to national GDP. The Council, to be led by the Minister of Economy, will drive unity and bring greater cooperation between the various legislatures in the UAE in regards to industrial development. A globally competitive industrial sector is high on the agenda of the UAE Government, and having a unified vision and strategy to develop the sector will go a long way to meeting this goal. Equipping UAE workers with the skills and knowledge needed to drive industrial growth will be influential in building a robust, industry-based economy. This includes those workers already engaged in the workforce, as well as younger students currently enrolled in school or higher education. There is little doubt that a growing and modernising industrial sector requires contributions from a diverse range of workers. Candidates with strong skills in the science, technological, engineering and mathematics fields will thrive in the future economy envisioned by the UAE’s leaders. But strong industrial growth also depends heavily on having enough vocationally qualified candidates to fill new and existing roles. Industry-reliant jobs are now more technical and highly skilled then in the past, and often require specific and intensive training. “With industry burgeoning in the UAE, employers often find it difficult to attract candidates with the level of vocational qualifications necessary to perform in a number of roles. Young people in the UAE, like in many other countries throughout the region and around the world, are entering university at unprecedented rates. And yet despite the high level of education achieved by university graduates, many of them find it difficult to secure meaningful work on completion of their degree. “Encouraging more of our young people into vocational education will therefore alleviate two of the main challenges created by a rapidly expanding industrial sector. Firstly, it will help to create enough candidates with the skills and knowledge demanded by industrial sector employers, and secondly, it will help to reduce youth unemployment figures created, in part, by an over-supply of university graduates. In other words, it will help to overcome the colloquially termed ‘skills gap”’. The announcement earlier this year from the UAE’s National Qualifications Authority (NQA) and Dubai’s Knowledge and Human Development Authority (KHDA) that some international qualifications will be recognised throughout the UAE is a step towards meeting employee demand for vocationally trained workers. Many qualifications, which have long been recognised by awarding agencies around the world, will now also be officially recognised by the UAE government, making it easier for employees to identify candidates with high quality vocational qualifications. This means for example, that a student completing a BTEC Higher National Diploma at Emirates Aviation University will now have his or her qualification officially recognised by employers, government agencies and institutions throughout the UAE. “Increasing dialogue between industry and education will also help to create a workforce ready to contribute to a dynamic, 21st Century industrial sector. Understanding what organisations are looking for in terms of skills and talent, and mapping education and qualifications against these needs is key. Making work-based training a significant component of vocational qualifications also helps to create candidates that can quickly perform in a work environment. Having apprenticeship-style programmes widely available helps to produce a valuable pipeline of highly capable workforce entrants. “But building workforce capacity in the industrial sector is not just about ensuring that quality vocational programmes are widely available. Young people – through educators, parents and other advisors – need to be made aware of the potential benefits a quality vocational education can bring. Often vocational education is still seen as a lesser choice to a more academic or university based education. Young people deciding on which education route to take need to be informed about the rewarding and often well renumerated career paths that a vocational education can lead to. Encouraging many of our best and brightest to follow a vocational path, will be fundamental to the UAE’s industrial sector meeting its potential”. It is no secret that a good education has the power to change a life. What is new is the demand for that change. Governments are investing more than ever before on educating their citizens, eager for them to compete in the global workforce. A growing global middle class is spending more of its own money on educating their families. Employers are looking for a new sort of colleague – someone with the skills to flourish in the 21st century. Combined with technologies that continue to develop at breakneck speed, the result is a world that has the want, and the means, to learn at scale. Yet there is so much to be done. One in five adults lack the written communication skills they need to progress in life, and 57 million children do not know what it’s like to step inside a classroom. Many millions more are in education, but not learning effectively. The global challenge for education is not just about providing access, but also progress and success. As the world’s leading learning company, we can help make a difference. But we also know that the challenges are too immense to tackle alone. So we’re fostering a global community of teachers, parents, students, governments, institutions and businesses, who can help us find the answers and deploy the solutions. – Access to high quality primary, secondary & postsecondary education. – Success in education through enhanced literacy, numeracy, knowledge & skills. – Progress as a result of education into a first career or advancement in career. Meeting the global demand for education will make us a more profitable company, profits which we invest back into improving education for everyone – to ensure that the ultimate prize is a better world for us all to live in. 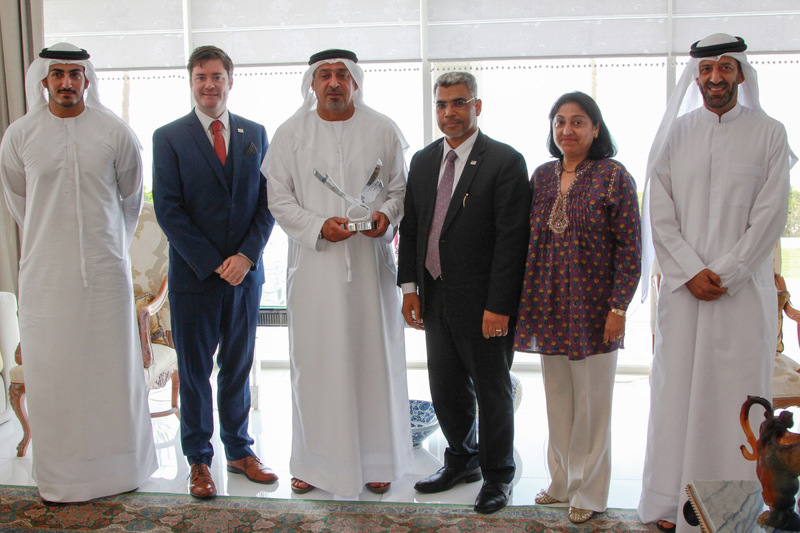 The University of Salford, United Arab Emirates (UAE) is delighted to announce that His Highness Dr Sheikh Sultan Bin Khalifa Bin Zayed Al Nahyan has been presented with a prestigious Alumni Achievement Award. In receiving the award, His Highness joins an elite rank of graduates who have achieved particular distinction in their chosen field. His Highness graduated from the University of Salford with a Masters in Political Science in 1989. Highness Sheikh Kalifa Bin Zayed Al Nahyan, President of the UAE. In addition, His Highness has an impressive education record, holding two doctoral qualifications alongside a distinguished military career that has seen him reach, thus far, the senior rank of Staff Brigadier. 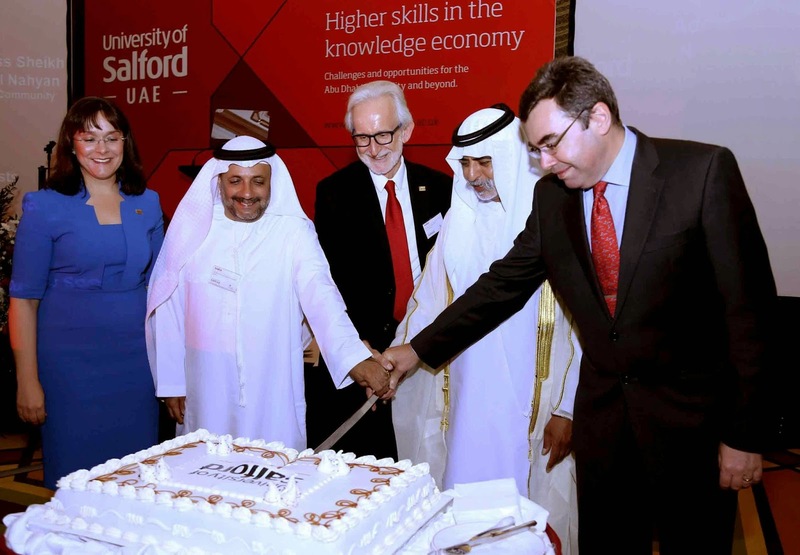 Graeme Mullin, Director of Partnerships in the Middle East, at the University, added: “At the University of Salford we are justly proud of the many great achievements of our diverse and vibrant global alumni community. This award also recognises the efforts and contributions of the Sheikh Sultan Bin Khalifa Al Nahyan Humanitarian and Scientific Foundation. Many of His Highness’s services to his country have been completed through this Foundation. The Foundation undertakes important work in pursuit of the advancement of scientific and medical practices that aim to improve the quality of life and alleviate human suffering. These include genetic screening and control programs that have a major impact in the community. As well as his academic and charitable endeavours, His Highness is also an accomplished businessman, sitting as Chairman of SBK Holdings and as a board member of the Abu Dhabi Investment Authority. SBK Holdings have a range of companies that work across many different industries in the Gulf region and around the world. SBK companies employ 10,000 people in the UAE and the group’s business activities cover everything from hotels and real estate to newspaper publishing and distribution. 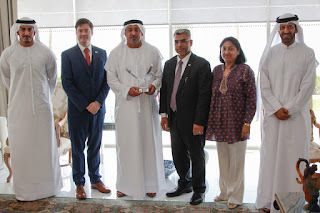 The award was presented to His Highness in a private ceremony by Graeme Mullin, Director of Partnerships, Middle East, at the University of Salford and Dr Ala Garad, CEO of Investors in People UAE and Chairman of the Salford GCC Advisory Board. Also at the presentation was Sunita Mirchandani, UAE Lead Advisor for Education and Training at the British Embassy in Dubai and Dr Mahmoud Taleb Al AIi, Executive Director of the Shiekh Sultan Bin Khalifa Al Nahyan Humanitarian and Scientific Foundation. Ministry of Education email service initiative to benefit 129,000 students. UAE, June 11, 2015 – The Ministry of Education (MoE) has introduced an email service catering to 129,000 students throughout its schools. This unprecedented move allows students to utilize technology for a safer means of communication. The dynamic interactive platform also enhances the students’ relationship with the academic faculty. Although the students are still currently in the process of registering to the service, on its first day the ministry has already activated more than 10,000 student emails. Abdul Rahman Al Hammadi, Assistant Undersecretary of Support Services, said that the ministry remains steadfast in its commitment to help students efficiently integrate Information and Communication Technology (ICT) into their educational process in order to ensure easy access to information and strengthen communication between student and teachers. Al Hammadi emphasized that the new email service is part of an electronic network the ministry has established to support the communication of key leaders, senior officials, workers and other affiliates in the educational sector. He also said this is part of a series of diverse smart services the ministry will be providing to parents, all of which feature high levels of data security made possible via advanced programs and applications. The Undersecretary added that the email network abides by safety standards that ensure the security of all student accounts, each of which has a capacity of up to 50 GB. He also pointed out that the ministry accredited the accounts with access to all electronic systems of learners through a Single Sign On (SSO) system. At the same time, the ministry has provided Microsoft Office Pro Plus to all students free of charge. Al Hammadi explained that the efficient use of Office Pro Plus is the third most important skill acquired by students worldwide, according to an International Data Corporation (IDC) report. Abu Dhabi School of Management – training program for government. UAE, May 10, 2015 –The Abu Dhabi School of Management (ADSM), an educational institution dedicated to developing the UAE’s future entrepreneurial leaders, has announced that it will be conducting Balance Scorecard for Government Professional Certification BootCamp in collaboration with the Balanced Scorecard Institute (BSI). This marks the first time that the BSI certification is being tailored for government entities. The first government version of the five-day Balanced Scorecard Certified Practitioner BootCamp will run from June 7 to 11, 2015 at the ADSM campus and will be delivered by the BSI Co-Founder and CEO Howard Rohm. Howard Rohm is a former U.S. government executive and the original developer of the Institute’s balanced scorecard framework, used worldwide by governments, industry and nonprofit organizations. BSI will provide the training and certification materials for the course, which is based on the Institute’s proprietary framework for developing balanced scorecard systems, called the Nine Steps to SuccessTM. Those who complete the course and pass the certification examination will be certified jointly by BSI and the George Washington University College of Professional Studies at the level of Certified Balanced Scorecard Practitioner. The Balanced Scorecard is a strategy performance management tool that everyone in the organization can use to align strategy to mission and vision, align employees and the work they do to the strategy, and focus on improved program and service efficiency, effectiveness and delivery to citizens. Managers use to monitor how staff under their supervision perform their duties and the outcomes of their actions. It is used by businesses, governments and nonprofit organizations to align business activities to the vision and strategy of the organization, enhance internal and external communications, and benchmark organizational performance against strategic goals. BSI is the original certifying body for balanced scorecard practitioners. Its award-winning framework, Nine Steps to SuccessTM, is a disciplined and practical approach to developing a strategic planning and management system based on the Balanced Scorecard. The Institute’s Certified Balanced Scorecard Practitioner programme is recognized worldwide, with around 2,000 practitioners from over 70 countries granted this level of proficiency so far since the program was launched in 2007. “Around the world, our certification training continues to make a difference in the ability of organizations to improve their performance, align the work of their people with their strategies and vision, and gain valuable operational insights through well-designed metrics. By combining our 18 years of experience with government and other mission-driven organizations we have been able to customize a program unique to the culture and goals of government. Through our partnership with ADSM we aim to help Abu Dhabi’s government entities and employees achieve these results and incorporate the Balanced Scorecard as an essential part of their management,” added Howard Rohm. FranklinCovey Middle East, a global company that specializes in performance improvement of organizations, has announced the first ever visit of world renowned author and motivational speaker Sean Covey to the Middle East. During his pioneering tour, Sean will discuss how The leader In Me whole-school transformation model – developed in partnership with educators – empowers students with the skills they need to thrive in the 21st Century. The Leader In Me, builds on the work of Dr Stephen R Covey’s The 7Habits of Highly Effective People and redefines what school greatness means by focusing on culture, leadership and academics. FranklinCovey is a global company specializing in performance improvement helping organizations achieve results that require a change in human behavior. FranklinCovey’s education division is one of the world’s most prominent and trusted providers of education-leadership programs and transformational processes to thousands of primary, secondary, and post-secondary schools and institutions around the world. Our mission is to enable greatness in educators and students everywhere. Education Key to Realising ENDP Employment Goals. UAE’s goal of 1% unemployment requires renewed focus on 21stCentury Skills. Dubai, UAE, 17 February 2015: A global expert on workforce education and training has welcomed the commitment of the Emirates National Development Programme (ENDP) to significantly reduce unemployment rates in the Emirates by 2021. Mr Frank Edwards, Workforce Development Director at Pearson, has said embedding 21st Century skills in the country’s education system will be crucial to realising this commendable goal. The ENDP has said that it wants the unemployment rate of Emirati nationals to fall below one percent by 2021, in line with the country’s 2021 National Vision. The ENDP believes that encouraging Emiratis to join the private sector in greater numbers, and seek jobs in burgeoning industries such as healthcare, construction, education and logistics, will help to achieve this target. Government efforts to reduce unemployment rates in the UAE have been largely successful to date, with unemployment falling from 10.7 percent to just 2.6 percent over the past 10 years. However, it is widely accepted that improvements can still be made, particularly in lowering rates of unemployment amongst those under 30 years of age, which are high by both national and international standards. 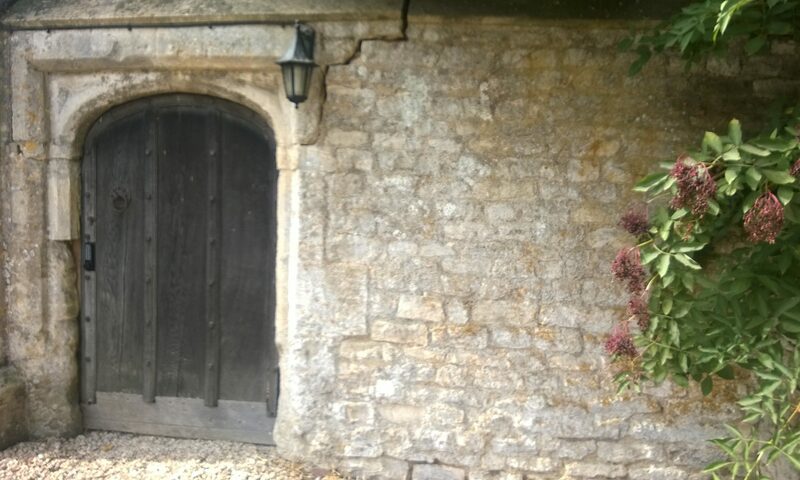 “What we are seeing as countries seek to align around the world is a clear gap between the skills and knowledge being provided to students in their formal education, and the capabilities that modern businesses require from entrants to the workplace in order to perform successfully in globally orientated, rapidly changing markets. Business leaders have done much, but more needs to be done and employers need to be working more closely alongside policy makers and education providers, across the entire education spectrum, to develop pedagogies, curricula and resources that provide today’s learners with an education that maps more closely to the business and the ever changing workforce needs of the future”. “Today’s learners are going to experience a variety of jobs and careers in their lifetime, many of which don’t even exist today. One way we can help them to thrive in the workforce of the future is to give them adaptable, useable skills that can be transferred across professions and industries. We cannot possibly give our current generation of learners all the knowledge and information that they will need for life after they have completed their formal educations. However, what we can do is to prepare learners how to learn, how to apply information and how to adapt. This is what will give them strong employability prospects in both the public and private sectors and maximise their value and potential to future employers”. 3rd edition of Autodesk University Extension Dubai announced. Omnix International, the leading distributor of Autodesk design software in the UAE, announced that it is set to host the third edition of Autodesk University Extension (AUx) Dubai 2014, the Middle East region’s premier learning and networking event for design and engineering professionals. Promising professionals an experience to “Learn, Connect, Explore,” this full-day interactive conference and exhibition will be held on December 17, 2014 at the Dubai World Trade Centre (DWTC) and expects to attract over 600 design and engineering professionals from the entire GCC region. AUx Dubai is part of ‘Autodesk University’, an annual series of Autodesk in-person and virtual user conferences that has already enjoyed two decades of success in the US. Brazil, Russia, Germany, India, Indonesia, Australia are some other regions that get to host an Autodesk University or an Autodesk University Extension annually. The event will feature futuristic 3D Design technologies, engaging training sessions and showcase of innovative projects and will also offer professionals the opportunity to network with international experts and peers from the industry. This year, AUx Dubai will see participation from industry experts, thought leaders and innovators from the Architecture, Engineering and Construction (AEC), Manufacturing and Media and Entertainment (M&E) industries from across the Middle East. In addition, AUx Dubai will also offer the opportunity for industry professionals to validate their skills by obtaining free Autodesk Certifications at the event on Autodesk’s range of 3D Design software like Autodesk® Revit® Architecture, Autodesk® AutoCAD Civil 3D®, AutoCAD®, Autodesk® 3ds Max®, Autodesk® Inventor® Professional. There will also be industry focused workshops on newer technologies, hands-on lad sessions and partner exhibits on the day of the event. Jon Pittman, Vice President, Corporate Strategy, Autodesk, Inc.
Dr. Jayant Deshpande, Director – CAE Division, Omnix International, said, “Omnix International is proud to host the third edition of Autodesk University Extension Dubai, which has become a ‘must-see, must attend’ event for the region’s design professionals. This event takes the focus on professionals who are serious about creating—how to come up with world-class, fully efficient and highly durable designs, drawings and the like that will be benchmarks for architecture, interior design and multimedia. The event proves to be very timely and strategic as the region is currently seeing a large influx of construction and development projects wherein companies are looking at Autodesk to gain competitive advantages and meet customer demands. To address this challenge, Autodesk University Extension acts as a cost-effective venue to receive advanced training, certification, learning about important trends in the industry and networking to meet potential clients and collaborators. Autodesk, AutoCAD, Inventor, Navisworks, AutoCAD Civil 3D Revit and 3ds Max are registered trademarks or trademarks of Autodesk, Inc., and/or its subsidiaries and/or affiliates in the USA and/or other countries. Autodesk is not responsible for typographical or graphical errors that may appear in this document. HBMSU & Paris Dauphine University sign MoU to cooperate in Islamic Finance education and training. [UAE, November 10, 2014] – Hamdan Bin Mohammed Smart University (HBMSU) and Paris Dauphine University (UPD), a renowned French public research and higher education institution, have entered into a landmark agreement to extend cooperation in Islamic Finance education and training. Both parties will work closely to design programs and initiatives in Islamic Finance tailored for the GCC and MENA regions. They will also jointly develop curricula that will give full credit for courses taken in either of the institutions. Serine El Salhat, HBMSU’s International Cooperation & Corporate Communication, Assistant Chancellor, and Prof. Arnaud Raynouard, UPD’s Vice President for International Affairs, signed the Memorandum of Understanding (MoU) during a brief ceremony at the HBMSU campus. The joint venture is timely given the growing global influence and popularity of Islamic finance. HBMSU and UPD provide excellent facilities for masters and research students to specialize in the field. Their world-class curricula and renowned faculty members help learners develop advanced and structured analytical and research skills to work in a wide range of Islamic Finance specialties. Serine El Salhat, HBMSU’s International Cooperation & Corporate Communication, Assistant Chancellor, and Prof. Arnaud Raynouard, UPD’s Vice President for International Affairs, during the signing of the MoU. The two institutions will also collaborate on other student and faculty exchange programs and jointly conduct faculty research. UPD’s Masters in Islamic Finance students will present papers before well-respected international academicians in HBMSU’s annual Innovation Arabia 8 conference, where UPD faculty and students can exchange ideas with their HBMSU counterparts and meet industry leaders and representatives. HBMSU learners, on the other hand, will join UPD students in their annual international trips. Since 2009, UPD has been offering the Masters in Islamic Finance degree locally and to other French-speaking nations. All-female team of Emirati students from Zayed University grabs top prize at Business for Better 2014. ]UAE, June 3, 2014[ – An all-female team of Emirati students from Zayed University in Abu Dhabi won top honors at this year’s Business for Better competition for their business concept of a Multi-Gym facility for pregnant and elderly women. The winning team, comprising of Shamma Alfahim and Sumaia Alharthi took home AED 45,000 worth of scholarships each. The competition, which is organized by Western Union, a leader in global payment services, and Al Ansari Exchange, a UAE-based foreign exchange and worldwide money transfer company, held the awards ceremony recently at the Address Hotel, Dubai Marina. The winners were determined after 13 shortlisted teams that represented various reputed universities from the UAE, presented their business concepts to a panel of judges earlier in the day. The 13 student teams made detailed presentations of their plans for sustainable business. Judges reviewed the presentations based on the criteria of ‘Originality of the Idea,’ ‘Business Concept and Description,’ ‘Proposed Implementation and Methodology,’ and ‘Financial Planning and Corresponding Budgets.’ Aside from Hatem Sleiman, Regional Vice President, Western Union, and Kamal Asif, Head of Business Development, Al Ansari Exchange, and the judging panel comprised of Imad Ghandour, Founder & Managing Director, CedarBridge Partners and Lisa Labonte, Founder & Chief Executive Office, Arab Youth Venture Foundation. “At Western Union we understand that education is one of the surest paths to financial inclusion. The Business for Better competition which we have organized for the 3rd year with our Agent Al Ansari Exchange demonstrates our commitment to support education, grow young minds and to create opportunity for all. We are proud of the achievements of the UAE’s students and thank all the participating universities and their students for their enthusiastic engagement with the competition. We congratulate all the winners for a job well done” Sleiman continued. Eight universities, including the American University in Sharjah, the American University in Dubai, Zayed University, Heriot Watt University, Abu Dhabi University, University of Sharjah, Amity University and Manipal University participated in the ‘Business for Better 2014’ competition. Beside the shortlisted teams and judges, the family and friends of the students, university representatives, and senior executives from Western Union and Al Ansari Exchange, also attended the award ceremony. The winning concept was the business proposal for a multi-gym especially for pregnant and elderly women along with teenagers and children. The proposed gym offers fitness programs, including yoga, aerobics and weightlifting for expectant mothers in order to keep them fit and healthy all through their pregnancy. In addition, there are specially designed Wii game programs for children and teenagers suffering from obesity. Other special features include exercises for elderly ladies to help fight age-related ailments such as arthritis and osteoporosis, fish pedicure, and a child center. Grabbing second place was the team composed of Ahmed Abdur Rahman, Abdul Jabbar and Muhammed Anas from Manipal University, who were awarded AED 30,000 each as the prize money. The Abu Dhabi University’s team of Israr Ahmed, Muhammed Abdulla and Waleed Ihsan was placed third in the competition and received AED 20,000 each. The judging panel also handed over special awards for ‘Most Innovative Idea’ to the team of Khaled Gaber and Ahmed Elsayed from the American University of Sharjah, ‘Most Socially Responsible Business’ to the team of Nikhil Kumar, Meghna Nambissan and Shyair Ganglani from American University in Dubai and ‘Best Presentation Skills’ to the team of Yasmeen Rwaished and Mohanad Rwaished from American University of Sharjah. Participating students were presented with Certificates of Participation and Certificates of Appreciation in recognition of their efforts. The University of Salford launches plans to help drive Abu Dhabi 2030 Vision. ]UAE, May 13, 2014[ – In the presence of H.H. Sheikh Nahyan Bin Mubarak Al Nahyan, UAE Minister of Culture, Youth and Community Development, The University of Salford (United Kingdom) last night (12 May) launched plans to significantly increase its impact and presence in Abu Dhabi over the coming months, with the aim of driving the development of public and private-sector skills within Abu Dhabi to meet the demands of the 2030 Economic Vision. Speaking at the launch of the University’s representative office in Abu Dhabi, attended by senior business people and officials, Salford’s Vice-Chancellor Professor Martin Hall announced plans for the development of a wider portfolio of postgraduate and CPD programmes, new educational and industry partnerships, collaborative projects and research initiatives in close consultation with industry and government. Inaugural cake cutting ceremony: Salford’s Vice-Chancellor Professor Martin Hall, H.H. Sheikh Nahyan Bin Mubarak Al Nahyan, UAE Minister of Culture, Youth and Community Development. Professor Martin Hall, Vice-Chancellor of the University of Salford, said: “The launch of our representative office will significantly enhance our rich history of working with educational partners and industry in Abu Dhabi, to deliver high-quality, postgraduate professional education in priority areas for the region and our own areas of expertise. The university will also embark on new, cutting-edge collaborative research that addresses the real-world problems of today and tomorrow and helps industry to harness research and development for the future competitiveness of Abu Dhabi and the UAE. Professor Hall added: “As the city seeks to respond to the pace of technological change and harness the capabilities of research and development for future competitiveness, there has never been a greater industry requirement in Abu Dhabi for real-world research. Employees from firms in Abu Dhabi, the UAE and the wider Middle East, regularly come to Salford to attend executive summer schools and block-intensive CPD delivery. On-site delegates can train at the Salford campus and unique digital learning, teaching and research space in MediaCityUK – home to the BBC and one of the hotbeds for creative and digital innovation in Europe. Industry partners within the Abu Dhabi over the past few years have included Malfraq hospital, to which Salford specialists have provided consultancy and training to ensure best practice and management of diabetic foot-care, to the significant benefit of the local population.